You don’t want to be caught off guard when driving during freezing weather in the middle of a long winter night. While you can’t prepare for every eventuality, there are certain winter survival gadgets that you should definitely have in your car. Thanks to recent advances in battery technology, we now have portable car jump starters capable of delivering hundreds of amps of peak current without being much larger and heavier than a typical powerbank. One such car jump starter is the DBPOWER 600A. As the name suggests, the DBPOWER 600A is able to produce up to 600 amps of current, which is enough to jump start just about any petrol or diesel engine in just a few seconds. And you don’t even need to have a set of jumper cables in your car because the DBPOWER 600A comes with its own heavy-duty cables with intelligent reverse polarity protection. Besides providing juice for your car, this affordable car jump starter can also output various voltages to charge your smartphone or laptop regardless of its manufacturer. You simply plug the electronic device to the right output, and the DBPOWER 600A will identify the best charging settings. With 18,000 mAh battery capacity, there’s enough power in this car jump starter to charge any modern smartphone several times. The DBPOWER 600A also has a built-in LED flashlight with strobe and SOS modes as well as a red emergency light that can be used to signal for help. Get it here. Most headlights produce around 700 lumens on low beam and 1,200 lumens on high beam. The Nitecore Tiny Monster TM26 flashlight produces up to 4,000 lumens even though it fits in the palm of the hand. The secret behind the unprecedented power of this pocket-sized searchlight is the simultaneous utilization of four Cree XML-U2 LEDs. The combination of Tiny Monster’s form-factor and brightness makes it a perfect addition to any glovebox. On the highest power setting, the Tiny Monster can easily replace a broken headlight thanks to its remarkable throwing distance of up to 454 meters, allowing you to safely drive to the nearest gas station or town to get help. On the lowest setting, Tiny Monster provides up to 1,000 hours runtime, drawing power from four 18650 (included with the flashlight) or eight CR123 batteries. The Tiny Monster flashlight has its own charging circuit, so you can easily charge it using the provided wall adapter or car charger without taking out the batteries. If you hurry up and purchase it on Amazon before it’s too late, you will also get a LumenTac keychain light for free. Get it here. Space blankets, those silver thermal blankets that are included in most first aid and survival kits, are great when space is at a premium, which is why there were developed in 1964 for the US space program in the first place, but a large wool thermal blanket is a much better choice for storing in the trunk of your car. The Woolly Mammoth thermal blanket is made of 80 percent premium virgin Merino wool and enhanced with a small amount of acrylic added to the warp and weft. The blanket measures 66 by 90 inches and weighs around 4 pounds. While machine washing and hand washing are both possible, the manufacturer recommends dry-cleaning to prevent shrinkage and loss of fibers. But because wool naturally resists dirt thanks to its low-static properties, your Wooly Mammoth blanket should look as good as new even if you clean it once in a blue moon. Get it here. The Leatherman OHT is the best multitool to keep in your car because each of its 16 tools can be opened with just one hand, including a strap cutter capable of effortlessly cutting any seat belt. In addition to the strap cutter, the tool also includes types of spring-loaded pliers and wire-cutters, 420HC knife, 420HC serrated knife, saw, #8-32 cleaning rod/brush adapter, can opener, bottle opener, oxygen tank wrench, Phillips screwdriver, large screwdriver, medium screwdriver, and the small screwdriver. As with all Leatherman multitools, the Leatherman OHT is covered by the company’s signature 25-year guarantee. Included with the Leatherman OHT is a large nylon sheath compatible with the MOLLE system. The sheath has a very discreet Leatherman logo on it, so it doesn’t draw unwanted attention. Get it here. Hand warmers are great for the winter months, but using a hand warmer that runs on the lighter fluid inside a car is a very bad idea. That’s why Zippo came up with their electronic hand warmer with a rechargeable 5,200 mAh battery. Zippo’s electric hand warmer has five heat settings and can heat up to 120 degrees Fahrenheit (50 degrees Celsius). 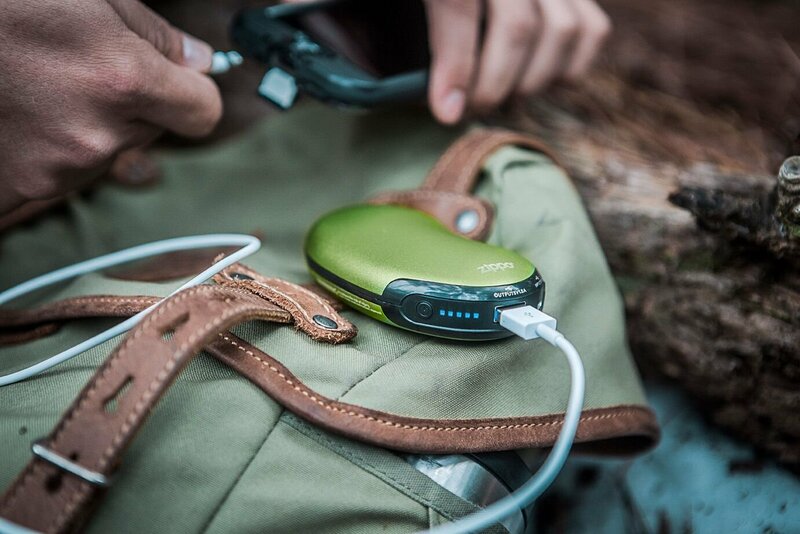 Thanks to the large battery, the warmer can run for up to 6 hours, but you can use the battery to charge your other electronic devices via a USB Type-A port, which is also used for recharging. Get it here.